Second day in Canada and lunch with Mumma Phan and fellow felines at Crown Princess. I've tried Yum Cha in Canada in the past a few years ago.Yum Cha in Cabramatta never seemed to measure up. They call Yum cha 'Dim Sim. here.... hehehehe. Oh silly Canadians. I found myself at the entrance of this place, I didn't know what to expect on my way here. It's so fancy from the outside, much different from any Yum Cha I've ever been to. The Eel Pastry is a new dish I haven't tried before, I absolutely love the texture of eel so this was a hit for me. The chicken feet were fantastic! Fell off the bone a bit to easily but it had an amazing sauce throughout. The Taro & Pumpkin, as much as the name tries to excite it, isn't anything special. They taste like plain steamed vegetables. The Rice noodle rolls had a tasty crunch to it, delicious with the soy sauce served on side. 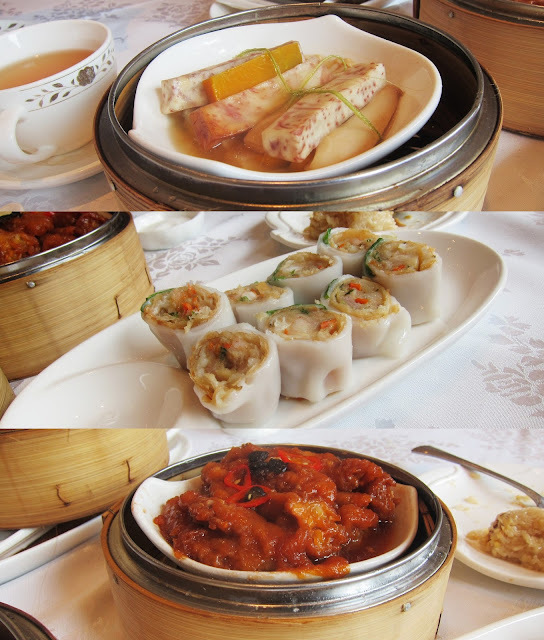 Vegetables are always a good side to eat along with all of these savoury Yum Cha dishes. The beef wasn't anything special worth ordering again. The lotus cake was filling but didn't offer anything worth coming back to for me. The jelly was also a miss. My favourites here were the variations of Rice Noodle Rolls and Chicken Feet, mmmhmm! This place is a bit more overpriced compared to other Yum Cha places in this area, it's definitely fresh and have many dishes I would come back for! I can't wait to taste the many more foods Toronto has to offer for me!